You are here: Home » Good Airport Food — An Oxymoron? Good Airport Food — An Oxymoron? Airports are notorious not only for grumpy, impatient, even rude travelers but also for terrible food (which probably contributes to the bad moods — in our family we call this state “hangry”). The options are usually limited to greasy fast food or tasteless sandwiches, old fruit and limp lettuce leaves. As someone who travels often, I dread the inevitable layovers and the search for something relatively healthy and fresh to eat. I always pack a large bag of snacks, filled with Larabars or Raw Revolution bars, an assortment of nuts and some fresh fruit. These only last so long, however, and at some point I start to crave real food–a meal. Then the search begins. On my last two trips, one to Los Angeles and the other to Milwaukee, I had to stop in Chicago O’Hare. As I strolled through the terminals to stretch my legs and look for lunch, I stumbled across not one but two promising options — it seemed too good to be true. The first was the new restaurant, Tortas Frontera by Rick Bayless, one of our favorite chefs whose cookbooks have become our bible for Mexican food. 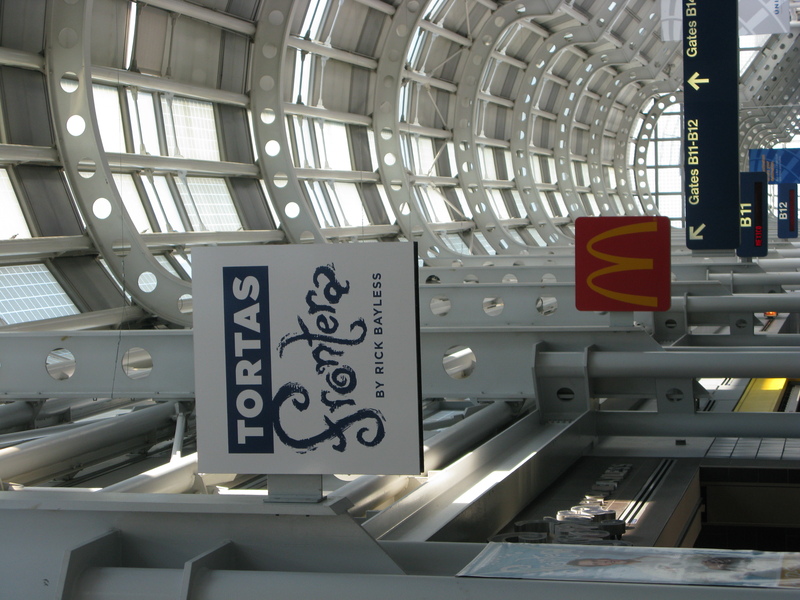 Rick Bayless' new restaurant in Chicago O'Hare, changing the standard for airport food. The menu includes both breakfast and lunch tortas and galettes, fresh squeezed orange juice, and homemade tortilla chips and guacamole. The most exciting part was the board listing where all of the ingredients come from, with a focus on all-natural, local products. As someone who does not order meat without knowing where it comes from, I was relieved to see such information displayed prominently. I ordered the Cochinita Pibil torta, with Yucatan pulled pork (all natural and antibiotic-free from Sioux Center, IA), black beans, pickled red onions and a fiery roasted habanero salsa. It was delicious. While the line can be long, and the wait and price are double those at the neighboring McDonald’s, the food is totally worth it and makes traveling so much more enjoyable. 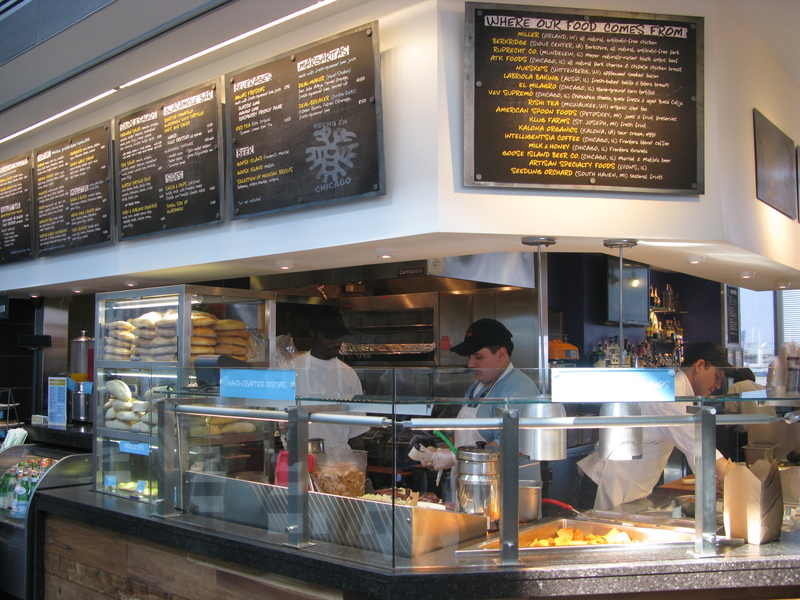 The second option is Wolfgang Puck Express, just a short walk from Tortas Frontera. 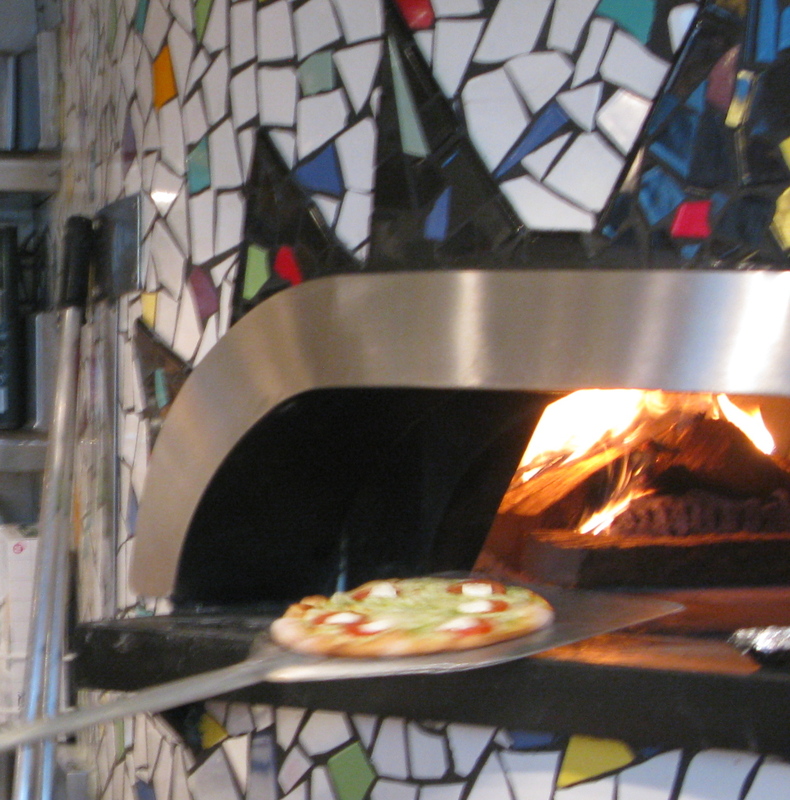 Here you can find decent wood fired pizza, soups, salads and pastas. These two famous chefs have found a way to make delicious, quick and relatively affordable food for travelers. Luckily, this trend for good airport food seems to be catching on. 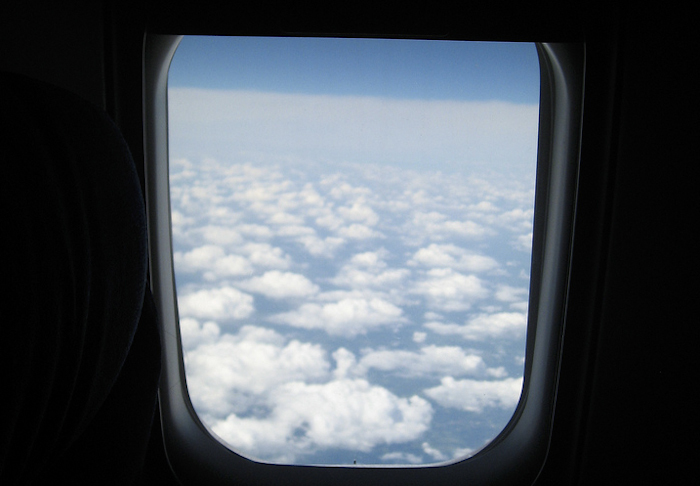 A few years ago, The New York Times featured two articles on where to find good food while flying: Grabbing a Bite Between Flights and Readers’ Pick. Bryan Alexander, our guest blogger last week, created a Wiki listing the best food to be found in various airports. This is how we found Vino Volo, one of our favorite places to grab a bite and a good glass of wine in airports across the country, including New York, Philadelphia and Washington D.C.
More often than I travel domestically, I fly to Europe, where the airport food is generally of higher quality, although it’s still often difficult to find what you’re looking for. One of my favorite places to stop is the branch of the legendary gelateria San Crispino in the Rome Fiumicino airport in Terminal A. Now we just need to change the food that’s served on the long trip over the ocean. As I get ready to move to Italy, another long trip awaits — and hopefully some good food during my layover in Madrid. Any suggestions? I’d love to hear all of your favorite places to grab a bite while traveling!